The best golf challenges often come from courses cut directly out of the natural terrain. That is certainly the case with Hidden Valley Golf Club in Norco, Ca. This course surely provides one of the best Norco golf deals in the area if not in all of Riverside County. It is quite nice to find a public course that looks like a private. The Hidden Valley Golf Club was designed by Casey OCallaghan and opened in 1997. This 18 hole course (par 72) covers 6,880 yards of rugged terrain from the championship (black) tees. The course has a rating of 73.8 with a slope of 141. While there are strategic man made hazards, its that natural hazards that create the challenge. The elevated tees and greens make every hole unique. You find shots over open canyons to be daunting and the hilly fairways create unique shots. 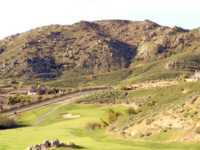 If you are looking for Norco tee times, Hidden Valley Golf Club tee times can be reserved online or by calling the course starter. Be sure to inquire about special promotions. Amenities include a full service practice facility, rental clubs, cart rental, pro shop, banquet facilities and the Villa Amalfi Restaurant. Players really enjoy this unique course. The terrain demands real shot making and the course is very well maintained. The natural habitat is a wonderful golfing backdrop.